Not quite everything about Xubuntu, but close. As you have probably noticed, new versions have arrived of Ubuntu, Xubuntu and other derivatives. One of the most exciting new features has received far less publicity than it deserves – the ability to “install” it onto your USB flash drive with just a few clicks. The advantages are obvious: just plug your flash drive into a computer and run your favourite operating system. What’s more, everything you do — installing applications, saving documents, editing preferences — will be saved to your flash drive and will be available to you every time you run it! The best news is that it’s astoundingly easy: all it takes is a few clicks. Of course, there are a few requirements. First, you can only run it on computers that support booting from a USB flash drive – this is the case for most computers nowadays. Secondly, you must have a CD or a CD image. 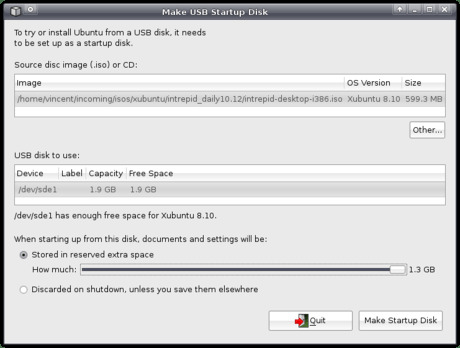 The latter can be downloaded free of charge – I, obviously, downloaded Xubuntu. Third, you’ll need to install usb-creator, the new application that is readily available in version 8.10 but which you can also download and install on version 8.04 (with Windows and Qt versions planned). And, last but not least, you’ll obviously need to have a USB flash drive. 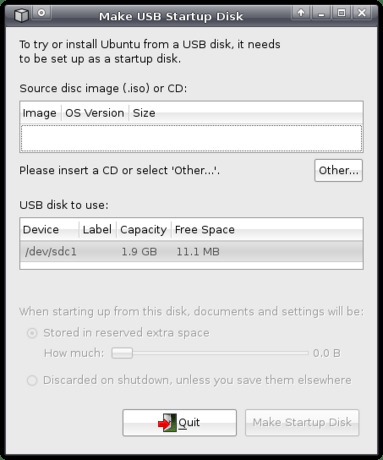 Once installed, you can find it in your menu as Create a USB startup disk (on Xubuntu it is located under Applications->System, in Ubuntu this would be System->Administration, IIRC). The first thing you’ll need to do is to insert the flash drive you’re planning to use. Usb-creator will then detect the drive – if multiple flash drives are inserted, you can pick from a list which one you want to use, and if the drive isn’t formatted yet usb-creator will give you the option to do so (note that this will destroy all files on it!). The next step is inserting the appropriate CD into your CD drive, or loading the CD image you downloaded before by clicking Other…. Finally, you’ll need to configure whether you want all your documents, settings and applications to be discarded on shutdown (i.e. act as a regular LiveCD) or if you want to save them to your flash drive (this is called persistency, or persistent mode). If you pick the latter, you’ll also be able to select how much space you want to reserve for this. Do note that usb-creator will not overwrite existing files on the drive – thus, if you want to use your entire drive, you’ll first have to delete all existing files. Now, with everything configured, click Make Startup Disk, and sit back and relax while usb-creator prepares your flash drive. Xubuntu 8.10 is coming, and the world needs to know it! To make this easier for you, Pasi Lallinaho (Xubuntu’s marketing lead) has prepared an image that shows how many days are yet to come before 8.10 will be released. After about a year and a half of development, the Xfce team has announced the alpha release of Xfce 4.6, codenamed “Pinky” “Pinkie”. 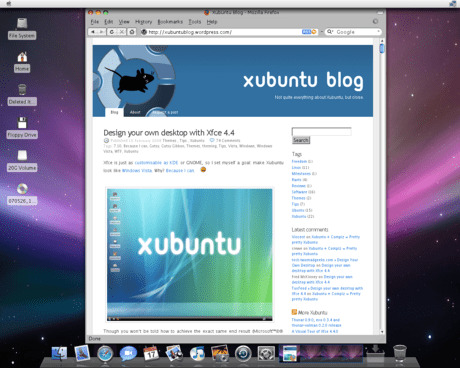 Xfce is the desktop environment and main reason for the existence of Xubuntu. It provides the file manager, panels and much more, keeping your desktop fast yet easy to use. 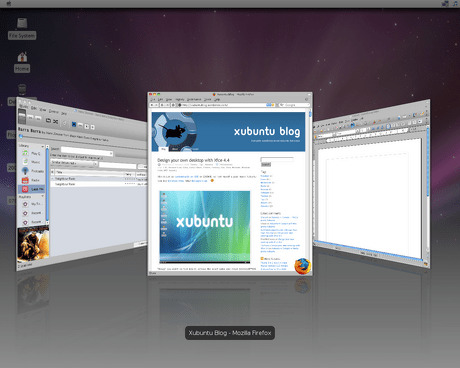 Thus, Xfce is one of the most important parts of Xubuntu, and the 4.4 release has been enjoyed by many users of Xubuntu since it was released. The new version of Xfce comes with many new features. Xfce now has a new configuration backend called xfconf, similar to gconf, but simpler and easier to work with. This brings more flexibility and better integration between Xfce components. You can now control your desktop settings through the command-line – this is not only handy for people helping on IRC (i.e. there is no more need to guide the user through all kinds of settings dialogs – though, IMHO, that would be less confusing for the user), it also means automated scripts can easily update your settings. One use I see for this is being able to change your keyboard layout using a key combination, an oft-requested feature by programmers. Speaking of key combinations: the confusing keyboard shortcut-themes have been removed and conflicts between keyboard shortcuts and window manager shortcuts are now easily resolved. All these new settings also come with updated settings dialogs, which can be started standalone as they are now, but also embedded into the settings manager – a feature of which Jannis made a screencast. Furthermore, Xfce now ships libxfce4menu. This is a software library aiming to implement the menu standard also implemented by GNOME and KDE and partly implemented by Xfce 4.4. While it is currently in use only by the desktop and the Appfinder (the latter of which has been completely rewritten to support libxfce4menu), it paves the way for a proper menu plugin in the panel that you can actually edit. Apart from the libxfce4menu support, the desktop manager xfdesktop has also received a few small improvements over the previous version. It has a redesigned preferences dialog, includes a few more options for the desktop background (such as colour saturation adjustment), and can now automatically start and stop managing a new desktop when you respectively plug or unplug a monitor. Finally, the Xfce mixer plugin has been completely rewritten to use gstreamer. One effect this has is that Xubuntu will probably definitely be switching to gstreamer-based applications (Xubuntu used to include a xine version of Totem, the movie player, but recently switched to the gstreamer-based version). The biggest benefit this brings users is that it will automatically ask to search for additional media support when it is not installed yet, which happens e.g. when you try to play an MP3-file on a freshly installed Xubuntu. All in all, though not as big as 4.4 was, this is shaping up to be another fine release of Xfce that has me looking forward to it. One question that people looking for help with Xubuntu often have is some form of “my panels/taskbar/menu disappeared”. Unfortunately, this is something that happens quite frequently. The good news is that this is fixed easily. All that’s required is to press Alt+F2 to bring forward the Run program window, and run the command xfce4-panel. Even though I’d very much like to say the opposite, most people will probably need help with Xubuntu at some point. Luckily, it is quite easy to find help – you just need to know where to look. First of all, you need to determine what kind of problem you are having. If you are new to Xubuntu, you will want to read the excellent Xubuntu documentation, that is also shipped with Xubuntu (in version 8.04 it is located under /usr/share/xubuntu-docs/index.html). It should be your first stop when trying to figure out how to connect to the internet, how to install applications, and similar basic tasks. All this thanks to the huge, voluntary efforts of the Xubuntu Documentation Team (you can also help out with the Xubuntu documentation yourself!). Of course, if you want to perform slightly more advanced tasks, such as setting up periodical backups on Xubuntu, the internet is your friend. There are a lot of great resources on the internet that can help you with anything from installing Xubuntu on the Eee PC to browsing Windows network shares with Thunar. However, be sure to double-check which version of Xubuntu the guide is written for. For example, the post on browsing Windows network shares I just linked to is, at the time of writing, a little outdated and contains unnecessary steps. It is also safest to look for articles written specifically targeting Xubuntu – tutorials aiming at Ubuntu users will often work as well, articles targeting just “Linux” are less likely to result in success. If you’ve spent time roaming the dark alleys of the internet, spit through every last bit of Xubuntu’s official documentation, but still don’t have an answer, there are a number of support options. One requirement for all these options is that you specify as much information as possible. This includes, but needn’t be limited to, the fact that you’re running/wanting to run Xubuntu, which version of Xubuntu you’re running, what you’re problem is, what the expected result is, and perhaps how proficient you are with Xubuntu. This allows other people to help you in the best possible way. The xubuntu-users mailinglist is, well, a mailinglist for Xubuntu users. All messages sent to a certain email address (xubuntu-users@lists.ubuntu.com in the case of xubuntu-users) will be delivered to everybody who has subscribed to that mailinglist. Thus, if you need help with Xubuntu, you can subscribe to that mailinglist, send an email to that address explaining your problem, and perhaps the next time you check your email, the answer is waiting for you. You might not have the patience to wait for people to respond, however. If that is the case, fear no more, as IRC comes to the rescue! IRC is a way of being able to communicate in real time with other people – in other words, a chatbox. First you need an application to talk IRC – Xchat, DarkIRC, whatever, it shouldn’t really matter. Using your IRC client, you need to connect to a network – FreeNode (on irc.freenode.net) in this case. Once you’re connected to the network, you need to join the appropriate chatroom (how old-school is that?) 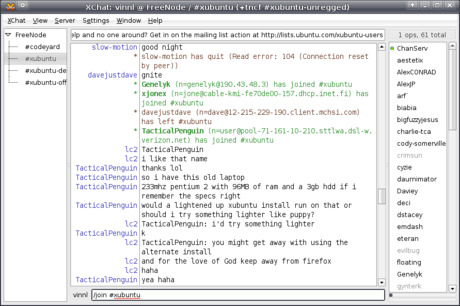 – the Xubuntu support room (or channel in IRC lingo) is #xubuntu. You can join by typing /join #xubuntu. Once you’re in – ask away! Be sure to be polite, not to spam the channel, and realize that, if nobody answers, probably nobody knows. Don’t ask the same question over and over again. It is no secret, however, that the Xubuntu community is not quite the size of the Ubuntu community. Luckily, many people in the Ubuntu community can also help you with your Xubuntu problems if nobody in the Xubuntu community can. The place to get help from the Ubuntu community is the Ubuntu forums. With a very large amount of active members, your question is very likely to find an answer here. Another place to get help is at Launchpad answers, which is part of Launchpad, a project management website where Ubuntu is managed. Here, you’ll be more likely to find developers, who are most likely to be able to help you. Even with this vast range of support options, some problems are just errors in the software – so called bugs. These can be reported at bugs.ubuntu.com, where a developer can look at it and, if you’re lucky, provide a fix for you and other users to enjoy. Of course, there will still be times when no answer can be found. However, after having read this article, you’ll hopefully be able to better find help yourself. And of course, if you cannot find help, feel free to ask me – I may not be able to provide an answer, but I might be able to give you some pointers. Xubuntu 8.04 is out! This release, along with those of Ubuntu, Kubuntu and whatnot, means that the Ubuntu servers are going to have a hard time with everybody and their stork downloading these new releases at the same time. Being the good open source citizen that you are, you are probably more than willing to take some of the load. Look no further, as BitTorrent is here to save the day! In short, BitTorrent allows you to download files from other people, meanwhile sharing the parts you have already downloaded with other people who, just like you, are eager to try out the latest and greatest the open source community has to offer. To download files using BitTorrent, you need a BitTorrent client. Since Xubuntu 8.04 includes Transmission, that is what we will be using. If you’re not using 8.04, make sure to install it. The first thing we need, is a torrent file, a file with a name ending in .torrent that contains all the information Transmission needs to download the appropriate files. The Xubuntu 8.04 torrent can be downloaded from Ubuntu’s torrent website, where you can select the graphical Desktop CD (which is what most people want) or the text-based Alternate Install CD. We want the torrent files for Intel x86 architectures (most computers) or for AMD64 architectures (you’d probably know if you need this, using 64 Bit). A torrent file is not that big, so it should not take too long to download and does not place much of a burden on the servers. After having downloaded the file to wherever you like, open up Transmission from Applications->Network->Transmission. When newly installed, Transmission will download all files into the same directory as the torrent file. Instead of adapting to software (by remembering where it downloads files to), I make software adapt to me, so when I open a torrent file with Transmission, I want it to ask me where I want the files to be downloaded to. Luckily, this is easy: simply open File->Preferences. While the preferences window is filled with cryptic terminology, the option I’m looking for is quickly found: all I need to do, is check the checkbox in front of Always prompt for download directory. You can configure a whole host of additional options in the prefences window, such as the maximum download and upload speed. Be aware, though, that if you lower the maximum upload speed (i.e. the speed with which you are sharing the files with other people), the download speed will also decrease, so as to encourage everybody to share as much as they can. When you’re done configuring Transmission, click Close in the Prefences window – it’s time to start downloading! Click File->Add and locate the torrent file you downloaded earlier. After you’ve opened the file and selected a target folder, Transmission will start downloading. While it will still be a long wait (the Xubuntu ISO image is a whopping 544 MB), if a lot of people are sharing the love then it’ll be faster than a direct download, and you’re helping other users at the same time. Once you’re done downloading, you’ll want to verify that the file you downloaded is the correct one. After you’ve done that, the big moment is there: you can install Xubuntu! Don’t close Transmission though! If you leave the window open after your download has completed, Transmission will continue sharing the downloaded file with other users – this is called seeding and is a good habit if you want to be a Nice Guy. You can also resume seeding after you’ve closed a torrent – simply re-open the torrent file and select the same download location. All in all, while often associated with illegal downloading, there are plently of legit situations in which BitTorrent saves the day. Now spread the love! By popular demand, I decided to push the limits of Xfce’s customisability even further. This time, I would make it look like Mac OS X 10.5 “Leopard”. Despite efforts like Mac4Lin, this task proved more difficult than trying to make it look like Windows Vista. Though I haven’t achieved the same degree of perfection as I did when replicating Vista, I still think I came pretty close. First of all, you will need to download Mac4Lin and extract it somewhere. There’s a lot of material to use in there, but since I have already discussed it in part 1, I won’t elaborate here on how to change your wallpaper, font (to Lucida Grande), GTK theme, icon theme and xfwm4 theme or, for those who use Compiz, Emerald theme. Removing the bottom panel, setting a background image and resizing the top panel have also been discussed. 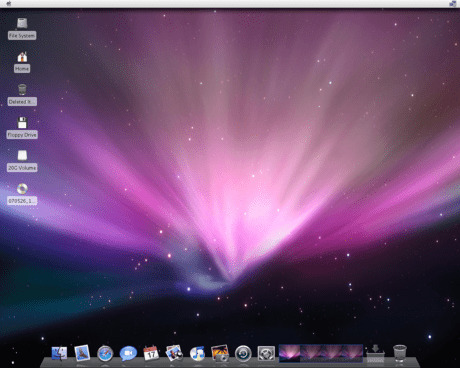 In order to replicate the looks of OS X as close as possible, though, there still is a lot to be done. One of the most noticeable things about OS X is its dock. Unfortunately, by default Xubuntu does not include such a dock by default. 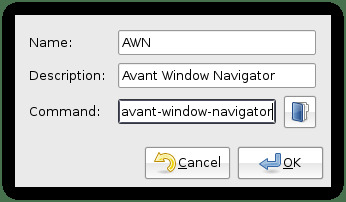 To have this functionality provided for, we will install Avant Window Navigator (AWN). Luckily, excellent instructions for installing AWN on Ubuntu 7.10 are already available, with the only difference being that we use Xubuntu and thus need to look in Applications->System instead of System->Administration. 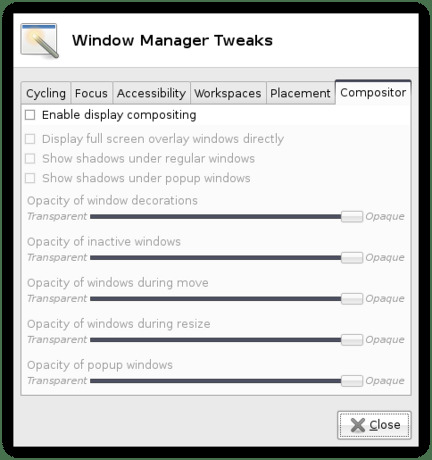 Do note that, in order to use AWN, you need to have Compiz installed or have enabled Xfce’s own display compositing by checking “Enable display compositing” under the Compositor tab in Applications->Settings->Window Manager Tweaks. You can run AWN through Applications->Accessories->Avant Window Navigator. In order to have AWN ran every time you log in, you will also want to add AWN in Applications->Settings->Autostarted Applications. The next step is making AWN replicate the OS X dock, which can be done through Applications->Settings->Awn Manager. If you click “Themes” on the left-hand side, you will get an overview of installed themes. By clicking “Add” you can install the AWN Dock Theme included in the Mac4Lin package you downloaded earlier, which you can then select and apply. We then click “General” on the left-hand side to configure the looks in the Bar Appearance tab. I disabled round corners, set an angle of 26°, a height of 52 pixels and an offset of 14 pixels. With that set, you can start adding applets to the dock by clicking “Applets” on the left-hand side. 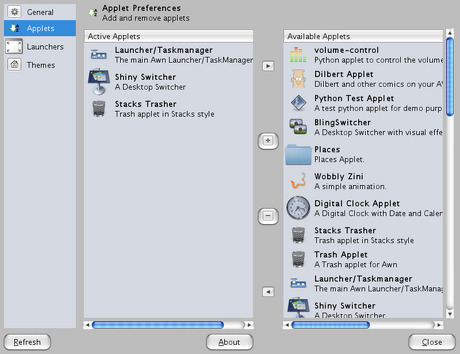 There are a whole range of applets to choose from, but for my OS X-like setup I opted for “Launcher/Taskmanager”, “Shiny Switcher” and “Stacks Trasher”. The next step was adding program launchers to the dock (well, technically, to the “Launcher/Taskmanager”). This can be done easily by opening a Thunar window (Applications->Accessories->Thunar File Manager) and browsing to /usr/share/applications. You can then drag applications to the dock to add them. Right-clicking on a launcher allows you to change its icon. 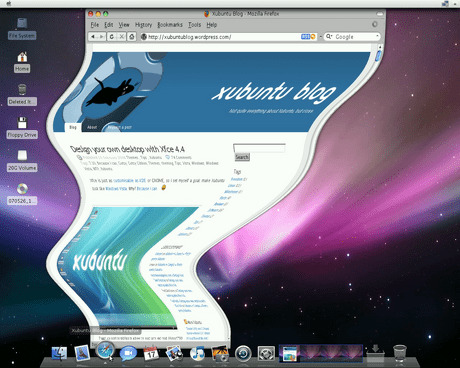 Also included in the Mac4Lin package is a Firefox theme, to make the Firefox experience similar to that of Safari. To install this, you open up the Add-ons window in Firefox from Tools->Add-ons, then click “Themes” on top. You can then drag the file FireFox Safari Theme - Vfox2.jar from the Firefox Addons folder into the Add-ons window. Another window pops up allowing you to install the theme. After the installation is finished, you will be asked to restart Firefox. After you have restarted, you can select “Use Theme” through the Add-ons window, after which you have to restart it once again. To install the extensions, you just select the extension file, copy it (Edit->Copy), then paste it in Firefox’s address bar on top (Edit->Paste). Again, an installation window will pop up, and you will be asked to restart Firefox when the installation has finished. Upon the next start, the extension will be installed. An interesting option which we didn’t explore in part 1 was the ability to change cursor themes. Conveniently, the Mac4Lin package also contains a folder named GTK Cursor Theme. Similar to how you installed icon themes, you extract the theme archive to /home/yourusername/.icons. 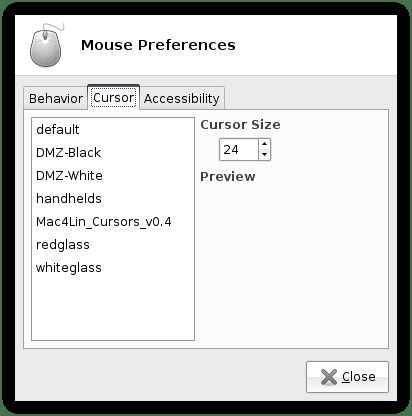 You can then open Mouse Settings (Applications->Settings->Mouse Settings), where the cursor should be located in the Cursor tab. Selecting the theme will warn you that the theme might not be applied until the next time you login. During the process of making my desktop look like OS X, I slowly started to appreciate the approach Apple has taken with its operating system. Instead of replicating the steps of the industry leader, they dare to be different. According to some, this has even led the industry leader to follow in Apple’s footsteps! Unfortunately, all this innovating does not make creating a lookalike any easier. The most noticeable inaccuracy is in the GTK theme: because of its use of the pixmap engine, button images need to be stretched both horizontally and vertically, so they often look very odd compared to their OS X counterparts. Other themes such as Leopardish also come close, but no cigar. That said, the result ended up quite nice. When compared to the Vista “clone”, a world of difference can be found. Clearly, an extensive range of customisation options is available to Xfce users, which emphasizes that Xfce really does not lag behind GNOME nor KDE when it comes to customisability. Those interested in moving application menus to their panel will be interested to know that it is possible, with support for Xfce’s panel. However, this is a very hackish solution and therefore strongly discouraged! As you’ll understand, I take absolutely no responsibility if it happens to end up in a disaster.